This new edition of the YSTT has been fantastic in terms of quality at all levels: quality of teachers, quality of students, quality of organization, quality of food, quality of kumite. Calligraphies by Hatsumi Sensei for the "Yûro shi tennô"
Quality of teachers: Each year I am amazed to discover how my friends have been evolving in good. Sven is deeper as ever and the depth of his teachings reminds me often of Hatsumi Sensei. Peter is more and more precise in his forms and understanding of the human anatomy with his Amatsu Tatara Holistic approach. Pedro is always coming with new multiple complex controls that look so simple that he is manifesting wabi itself. Quality of students: This year we had more than 30% newcomers to the taikai and rapidly I got the feeling it was the same group as the years before. It is so nice to see the same students coming year after year and to see them improve more and more. Even the beginners were so nice to teach to. This taikai is a real pleasure to teach because we can adapt the level of our teaching to the level of the groups we have. This year I really enjoyed a lot going back to the basics with the kyû and the feeling of real fight with the high ranks. There is always something to learn for us. Quality of organization: This year for the first time Bruno took the responsability of the YSTT as I was teaching abroad a lot. He did a damn good job and I don’t think that any taikai was better organized and managed than this last edition. Thank you Bruno! Being a 15th dan didn’t weaken you it made you more powerful. I also want to thank the taikai Team who made our stay in the dôjô so likeable. They were so committed and efficient that I had a hard time recognizing them. Thank you all for your hard work. All the attendants will remember you. Quality of food: When Bruno said that one of our students was 1 star michelin “chef” and that he could cook for us at the taikai, I honestly didn’t believe it would be possible for such a big number of people. I was wrong and this has been the best taikai food I ever had the chance to eat. Goodbye sandwich, welcome meatballs, meatpie, butter chicken and starters and cheese and desserts. Jean-marie I love you! Thank you for your hard work and sacrificing your training time in the morning to cook for us. Quality of kumite: Above all a taikai is a kumite, a reunion of many bujinkan practitioners dedicated to learn more about our art and to share friendship. In this respect this YSTT has been a real success. Fri 91 participants, Sat. 123 participants, Sun. 131 participants. No injuries, no violence, a lot of work. This taikai was created to replace the missing taikai by hatsumi sensei. Training is first but in the old days these taikai were the occasion to reunite the bujinkan family. 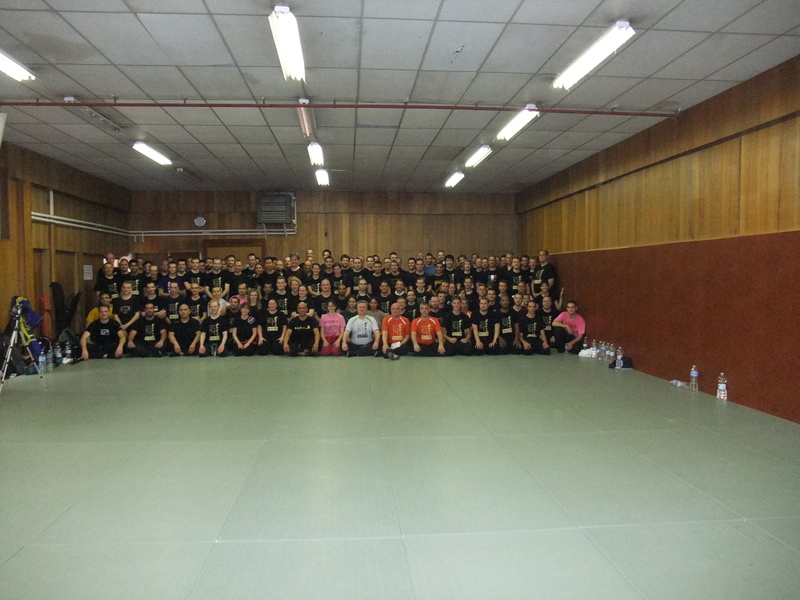 This YSTT was a real kumite regrouping participants coming from 19 countries (the last being bielorussia and poland). Thank you all and we hope to see you next year again in Paris! 1. The YSTT2012 will be held in London for the 25th anniversary of the first taikai directed by hatsumi sensei in Europe and organized by Peter King in 1987. 2. the video of the taikai will be available for download for the members at http://www.koimartialart.com in a few weeks. Just like to mirror Arnauds sentiments. As superb, if not better than previous years. So good to see old friends and make new ones. As the boss said at the seminar ‘the feeling of community and family keeps forever growing.’ Thanks to all for making this the premier event of the year!